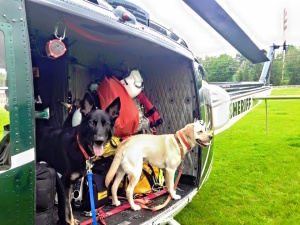 King County Search Dogs (KCSD) EIN 91-1814938 is a 501(c)3 tax-exempt organization incorporated in Washington State that operates as a unit of the King County Search and Rescue Association. The content of this website is licensed under a Creative Commons Attribution-ShareAlike 4.0 International License. You may copy and redistribute the material in any medium or format and remix, transform, and build upon the material for any purpose, even commercially. You must give appropriate credit, provide a link to the license, and indicate if changes were made. You may do so in any reasonable manner, but not in any way that suggests the KCSD endorses you or your use of the material. If you remix, transform, or build upon the material, you must distribute your contributions under the same terms as this license. 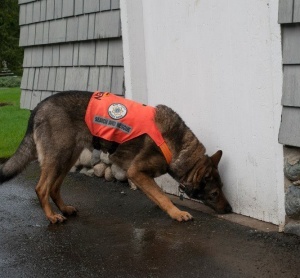 King County Search Dogs, its Officers, Directors and Members make no representations or warranties of any kind on the accuracy or suitability of the information in this website or the materials and websites to which it provides links for any purpose. This includes but is not limited to dog training and health as neither this website, nor any other online resource, is a reliable source of sound medical advice and dog owners should take animals to local veterinary professionals for regular examinations and vaccinations as well as for the care of sick or injured animals.